Designed and built using the latest technology, our clean burning stoves burn wood, coal and smokeless fuels at maximum efficiency and output low emissions, giving a clear view of the fire. Perfect for lodge home living. Lodges are ideal for wood burners. They provide an eco form of heating perfect to warm your lodge. 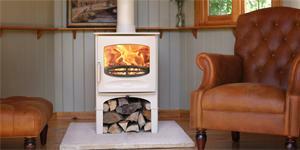 We can provide a wood burner or help with an aftermarket plan to instal a wood burner. Your Charnwood is an excellent long-term investment designed to give you years of satisfaction and our after sales service via our official dealers is an important part of this.